Known as one of Africa’s top safari regions, this water-wilderness of papyrus swamps and watery floodplains, dotted with islands and laced with a network of channels is home to a huge variety of wildlife and birds. Elephant and buffalo occur here in large herds, as well as Burchell’s zebra, kudu, blue wildebeest, impala, red lechwe, and tsessebe, amongst others. Eland, Sable and roan antelope also occur in the region, and the papyrus areas of the Delta have growing populations of sitatunga, which live deep in the swamps. black-backed and side-striped jackals. A wide variety of mongoose and the sly bat-eared fox can be found, while in the water spotted-necked and Cape clawless otters are often seen. Rhinos were re-introduced to the area in 2001, and one can now see the Big Five in this rich and abundant wildlife oasis. No fences in this area allow animals to roam freely across large tracts of land between the reserves and the national parks. 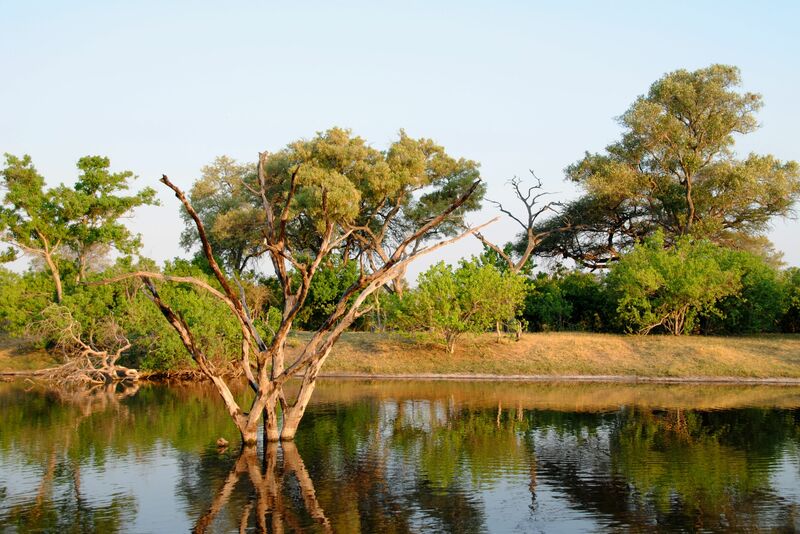 The permanent water of the Kwando-Linyanti riverfront is a big drawcard for herds of elephant, impala, buffalo red lechwe, and sometimes sable antelope. In the dense riverine forest and on the plains, kudu, wildebeest, zebra, warthog, baboon, tsessebe, and giraffe and are common, while further from the water, the drier forests host herds of eland and roan antelope. Predators are numerous with pride of lion and cheetah on the open plains and the elusive leopard favoring the wooded areas in the more broken country. Wild dogs ranged throughout the region and spotted hyena barks are prolific at night. Spanning the dry grassy plains in the southern part of the Linyanti Concession with a permanent water source from the Savuti Channel, Savuti (also Savute) is possibly one of the best game viewing destinations in Southern Africa. Most noted for its incredible elephant population, which can reach enormous densities during the dry winter months, a plethora of other game make this their home, including giraffe, buffalo, and warthog. The summer months see the zebra migration passing through, bringing the predators out of the woodwork – lion, spotted hyena, cheetah, leopard, wild dog, and jackal roam the plains in search of food and are all commonly sighted. This area is also well-known for spotting the rarely-seen aardvark and aardwolf, and birding is spectacular with over 400 species of birds recorded. Contrary to popular belief that the Kalahari is a sparse and desolate desert, in reality, it is a semi-arid grassland with wide open savannahs and a fascinating array of wildlife. The great salt pans of the Makgadikgadi attract huge herds of springbok, hartebeest, giraffe and gemsbok, which increase between December and April when the rains can turn the park into a veritable salad bowl for herbivores. During the wet season, the flooded pans spring to life, attracting massive migrating herds of zebra and wildebeest in their thousands, as well as flocks of flamingos, who give the salt pans a rosy-pink hue. Famed for their size and beautiful manes, Kalahari lions are a sight to behold and move around in a great pride. Rugged mountains hide elusive leopard, which is rarely seen, while the Kalahari grasslands lend themselves to excellent cheetah viewing. Brown hyena is relatively natural and wild dog are also occasionally seen game drives. This is old Africa, where intrepid explorers and big-game hunters have visited for centuries. Famous for huge herds of elephant and buffalo, and large pride of lion that has learned to hunt them; for a river that apparently flows both ways; and for the mysterious, disappearing (and reappearing) Savuti Channel, Chobe is wild Africa at her best. Some 70 000 elephants live in and around the Chobe National Park, crowding the banks of the Chobe River and Savuti Channel during the long dry season, alongside buffalo, hippo, and crocodile. This is the place to see Africa’s teeth and claws in action where lions regularly hunt the vast herds of buffalo and clash with packs of hyenas. Chobe is the setting for a spectacular summer zebra migration, where thousands of animals move in complex, old patterns determined by the rain and available food, as well as the best place to see packs of wild dogs hunting and an abundant bird life.